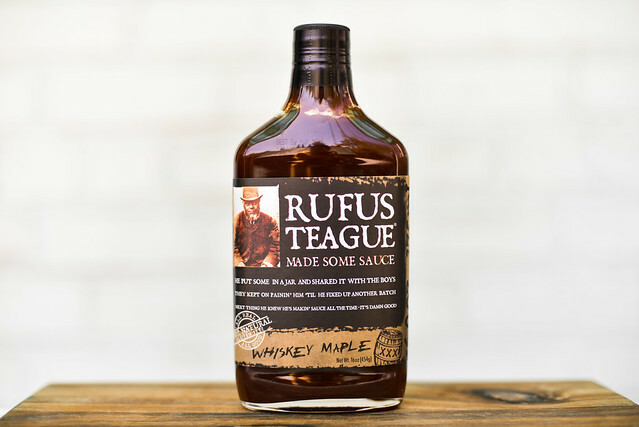 Rufus Teague Whiskey Maple builds a decent balance and progression of flavors, but comes in a little too heavy with the molasses and liquid smoke, which mask the maple syrup and give a bit of a harsh profile. 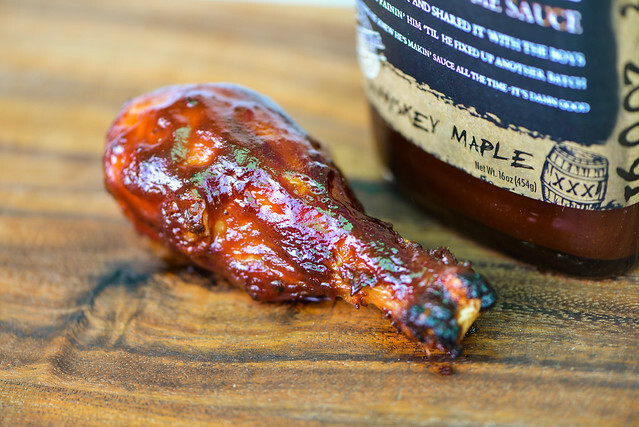 Barbecue sauces often has the same backstory—a man gets a smoker, falls in love, makes sauce, and bottles it. So it went for creator of Rufus Teague, John McCone from Shawnee, Kansas. My hat goes off to him though for crafting a more mysterious aurora to surround his sauces by slapping a seemingly vintage photo on the front and giving a lengthy story of this fictional man and his sauce on the back. 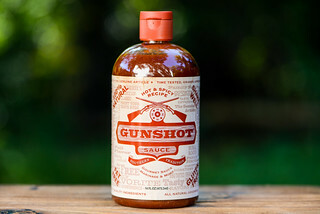 Creating a bit of intrigue, this sauce—which comes in flask bottles—certainly stands out on the shelf. It also stood out to numerous judges who have awarded Rufus Teague sauces honors from 2002 to 2007. The scent of forest products fills the nose as the aroma of maple syrup and liquid smoke enter into the nasal cavity. Along with those two, the heavy sweetness of molasses mixes in to form the base of the aroma. Smell a little deeper and a light vinegar tanginess comes out, as well as tomatoes that aren't too sweet, Worcestershire sauce, and just a touch of whiskey. 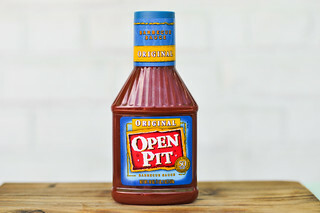 This dark maroon, opaque sauce has a smooth texture with little to no spices seen. It weighs in between medium and thick. It falls from a suspended spoon in one big glob at first, followed by a few smaller ones, then stops and leaves the spoon coated in a thick layer of sauce that completely covers the silverware. 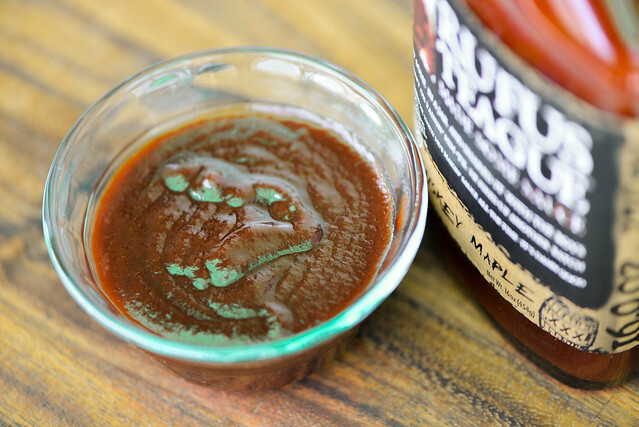 This sauce starts out with a strong and deep tomato and molasses flavor. Right after that initial hit of sweetness and acidity, the sauce's namesake of whiskey quickly makes an appearance. Vinegar then builds up a tartness that overtakes the whiskey, but the tomato and molasses stick around and fall into a nice balance between sweet and tangy. Then the liquid smoke makes its play and holds strong until the end, which closes with a mild heat. Maple syrup can only faintly be tasted, getting lost behind the more dominant molasses. This sauce didn't bake down well, instead just sitting on the surface while roasting over indirect heat. This lead to significant burn off over direct heat, and the final chicken leg need some touch up in the end to be evenly coated. The flavor tilted the scale to mainly sweet. The tomato was still pretty heavy, but sugary molasses was front and center. The whiskey was actually more distinguishable than out of the jar, giving the sauce an extra dimension that would make it stand out in a crowd. I was pretty into the first Rufus Teague sauce I tested, so I was looking forward to trying out more. Unfortunately, Whiskey Maple didn't quite live up to Blazin' Hot. The flavors were more heavy handed here, with the molasses and liquid smoke giving in a little too sweet and too harsh of a profile in my opinion. The whiskey added a nice touch that you don't get in many sauces, but it wasn't a saving grace. Maple syrup struggled to be tasted behind the stronger molasses, which was a bit of a disappointment. 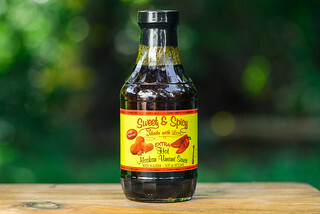 On the grill, the sauce swayed too far to the sweet side for my taste, and it didn't bake in well, so I'd recommend this sauce more as a condiment. I think it would pair well with beef, making it a decent choice for steak or a burger. My wife got us some just based on the label but I had pretty much the same thoughts as you. Heavy on the liquid smoke.